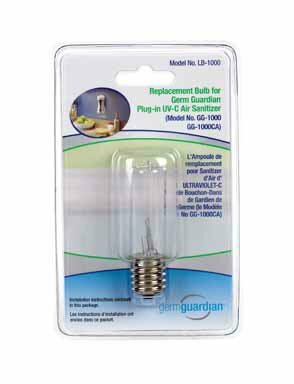 Plug In Air Sanitizer Replacement Bulb by Guardian Technologies at Humble Opinion. MPN: LB1000. Hurry! Limited time offer. Offer valid only while supplies last. Sold as 3 UNITS at $13.42 per unit. (1 unit = each.) For model GG1000 Germ Guardian plug-in air sanitizer. For SKU # 6107445 - model no. GG1000. Sold as 3 UNITS at $13.42 per unit. (1 unit = each.) For model GG1000 Germ Guardian plug-in air sanitizer. For SKU # 6107445 - model no. GG1000. Manufacturer number: LB1000. SKU #: 6138416. Country of origin: China. Distributed by Guardian Technologies.